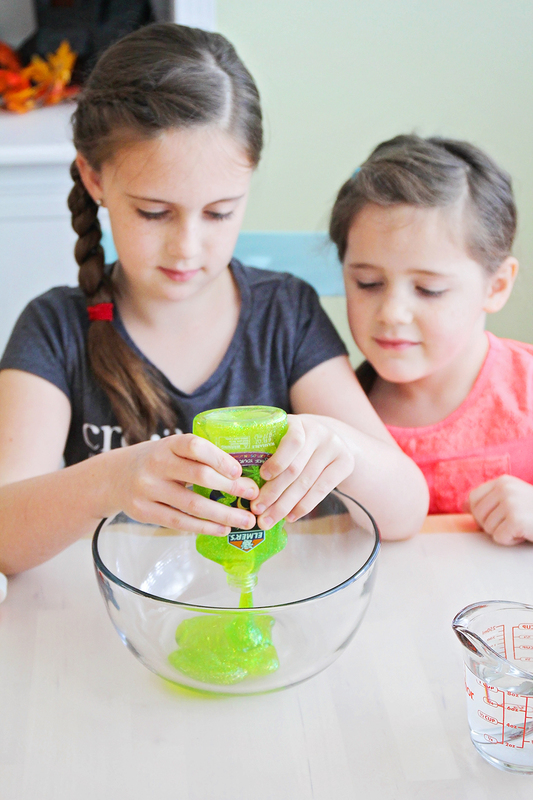 This three ingredient Halloween slime is so quick and easy to make. It's the perfect Halloween activity to do with the kids! 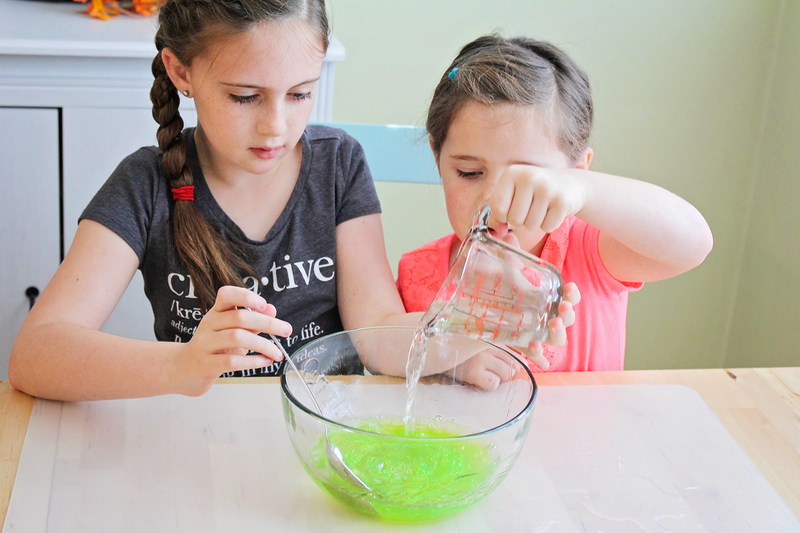 Are your kids as obsessed with slime as mine are? I didn't even know that slime was a thing until last year. My daughter made slime with her fourth grade class one day, and it has been a huge favorite with both girls ever since. They can spend literally hours playing with it (which is pretty amazing, given that their attention span is usually less than 10-15 minutes). It's fun, easy to make, and generally pretty mess-free. A total win, in my book! You'll start by mixing your glitter glue and a little bit of water in a medium bowl. The water helps loosen it up and make it easier to work with. Next you'll mix a teaspoon of borax into a cup of warm water until dissolved, then pour the borax mixture into the glitter glue. The borax will work its magic and turn glue into slime! Mix the glue with your hands until it starts to cling together, then pull it out of the water and knead it between your hands until it firms up a little and stops being so sticky. How cool looking is that slime? 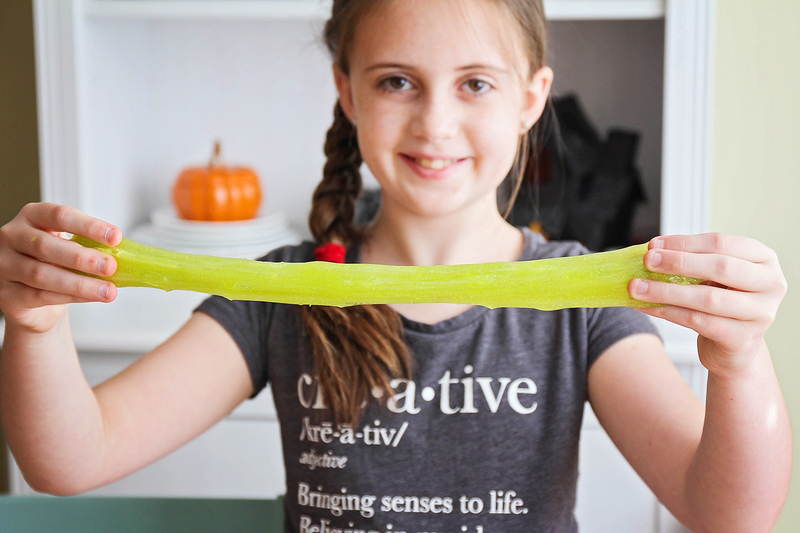 The slime is stretchy and a little sticky, and endlessly fun to play with. My kids like to cut it with plastic utensils and pretend that they're cooking, or wrap it around the end of a tube and then blow on the tube to make a bubble. It's endlessly entertaining! Add the glitter glue to a medium bowl. Add one tablespoon of water and mix until combined. In a small bowl or measuring cup, stir the borax into the remaining cup of water. 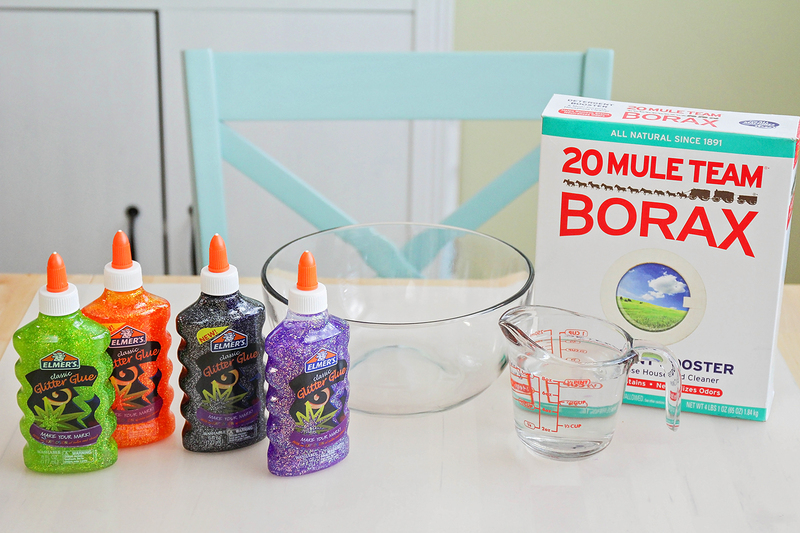 Pour the borax water into the glitter glue, and mix with your hands until the slime starts to come together. 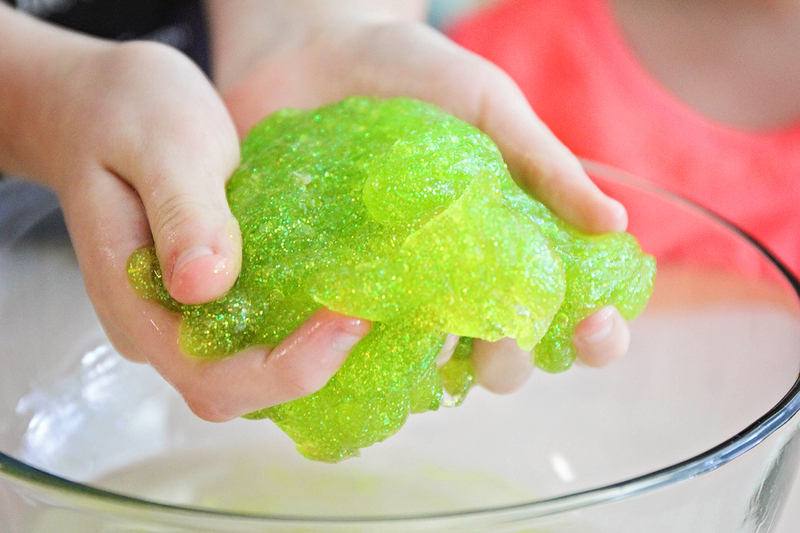 Pull the slime out of the water and squeeze from hand to hand until the slime reaches the desired consistency. Store in an airtight container. 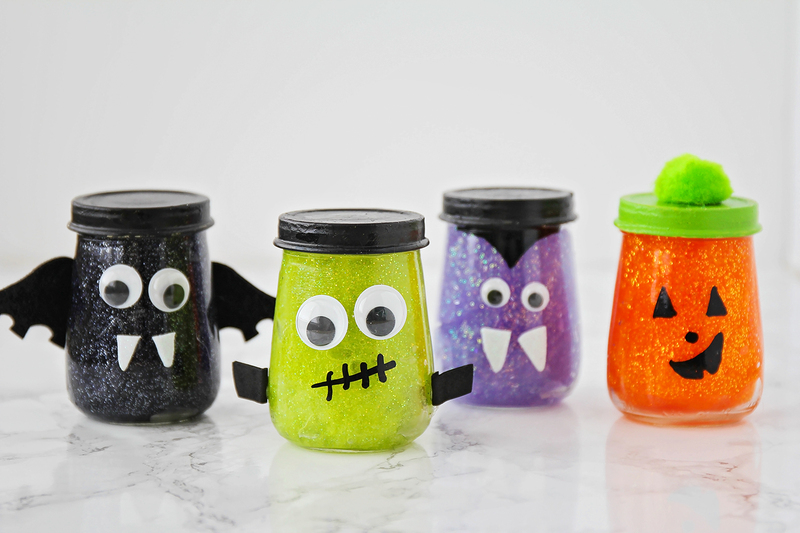 We decided to make things a little more fun and festive by decorating some jars to hold the slime. I found these cute little baby food jars at Target, and painted the lids with craft paint. We found googly eyes and multicolored craft foam at Michaels, and made some little monster faces for the jars. Seriously, so cute! I used a paint pen to draw the pumpkin face, Dracula's widow's peak, and Frankenstein's monster's mouth. I would definitely recommend a paint pen over a regular sharpie. It went on thick and smooth and looks great! 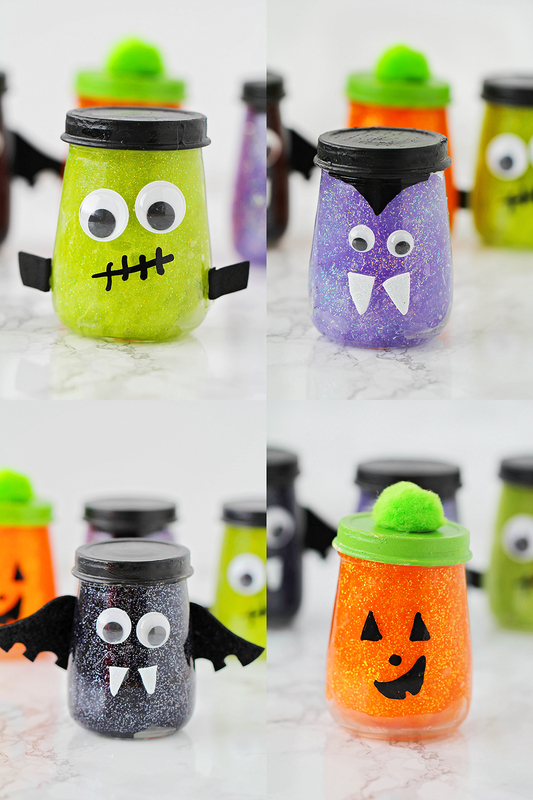 These Halloween slime jars are the cutest thing ever, and so much fun to make! Did you buy empty baby food containers at target or full? And where did you buy your craft paint/what kind! Thinking of doing this with my third grade class for our fall party! I bought full baby food containers of applesauce, and just emptied them into a bigger container and put it in the fridge. My kids ate it later and had no idea that they were eating baby food. :) I used Martha Stewart craft paint from Michael's for the lids, but it had a hard time sticking. If I do this again in the future, I will probably either use spray paint, try some kind of chalk paint, or use a primer on it first to help it stick.